A good condition pipeback light cavalry officer's sword / sabre, Victorian. 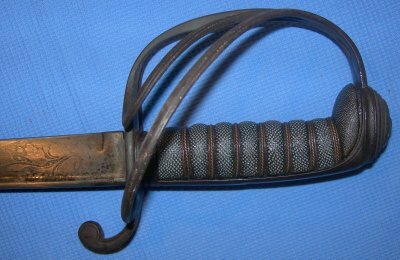 This is a fine light version of the 1821P British light cavalry officer's sword; I suspect circa 1840 based on the etching style. This is a lovely sabre though the etching is feint, especially the maker's name tablet which I can only distinguish a few letters of plus "7" in the address and "London". The 32 1/8 inch blade has some patina but not much and is firm in the hilt. The hilt is well patinated but solid. The fishskin grip is in very good order, as are the twisted wire grip bindings. The steel scabbard is equally in good order and the sword sheathes very well and holds the scabbard firm. 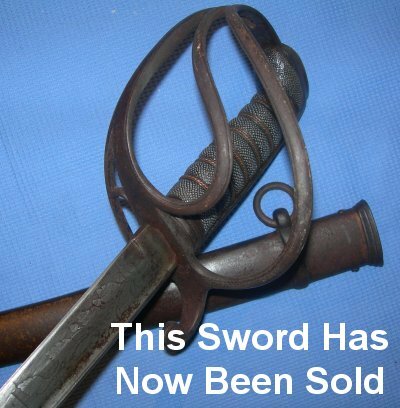 A great investment and iconic cavalry sabre. Further / full sized photos available upon request. Item Ref: 774.